OMRON Corporation, a global leader in automation, sensing and control technology, has announced "OKAO Vision Face Recognition Sensor", a world first in face recognition technology which can be implemented in PDAs, mobile phones or other mobile devices with a camera function. The ability to recognize and verify the authenticity of the user through face recognition is meant to contribute to greater security and safety for mobile devices, and the information they contain, in the future. The technology will be on show at the "Security Show Japan 2005", which will be held at the Tokyo Big Site from March 2nd to March 4th, 2005. "Functionality in mobile phones and other mobile devices is upgrading significantly from simple phone calls and e-mails to include a variety of access, payment and planning services. As a result, mobile devices are carrying ever more personal information including address books, schedules and payment information," said Masato Kawade, Senior Manager of the Sensing Technology Laboratory in Kyoto. "The 'OKAO Vision Face Recognition Sensor', featuring OMRON's core 'Sensing & Control'technology, has been designed to protect this information even when the mobile phone is lost or stolen." Camera equipped mobile units enabled with the 'OKAO Vision Face Recognition Sensor' require no additional hardware. 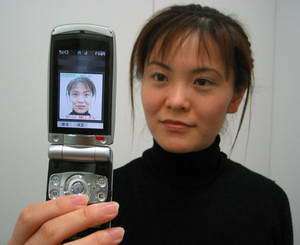 Users register their own face image to their unit with the unit's camera. To use the unit, the user simply takes his or her own photo. The 'OKAO Vision Face Recognition Sensor' will automatically detect the user and unlock the unit. The identification process takes less than a second from snapping the photograph. Further, their is no need to adjust the camera position when taking the photo. If the face is included in the photo, the sensor will detect the owner automatically. The new sensor is made possible with OMRON's 'OKAO Vision', a core company sensor technology, which allows the technology to transcend previous limits in memory capacity and processing ability by successfully downsizing and speeding up the algorithm. The sensor tests successfully more than 99 times in 100, and is fully Symbian, BREW, embedded Linux, and ITRON OS compatible. Data registration measures 1.5 KB per photo, while memory usage measures just ROM 450 KB or RAM 370 KB. Full processing time is approximately one second with MSM 6500. 1. Cameras equipped mobile units enabled with the 'OKAO Vision Face Recognition Sensor' require no additional hardware. 2. The identification process takes less than a second from snapping the photograph. 3. No need to adjust the camera position when taking the photo. If the face is included in the photo, it will detect the owner automatically. 1. 99% recognition: The sensor identifies the owner 99% or more (OMRON tests). *According to OMRON research on face detection and recognition technology as of February 28th, 2005.